Newspaper article from 1935 with added comments in brackets. VIRGIL, it is recorded, found a peculiar pleasure in lingering over the site of Rome before the birth of the historic city, when cattle lowed in the Forum. There are inhabitants in the rural part of St. Anne's who, like the writer, love to transport their fancy back to the time when the murmur of the sea, the cry of the seagull and the warbling of the birds were the only sounds on a charming stretch of coast. Before the pioneers came, Lytham Common extended from Ansdell to Division-lane railway bridge (St.Annes side of Pontins) . Beyond that point, northwards, to Squires-gate, was in the rural district of Little Marton. An unbroken range of sandhills from South Shore Pier to Lytham was literally alive with rabbits. The Squire's shooting parties were encountered frequently, even long after St. Anne's had been called into being. The dells of the sandhills were a source of delight for the naturalist, with their 500 varieties of bonny wee flow'rets peeping and smiling through the grass. The beach, from South Shore to Lytham, was entrancing on a sunny day when the wavelets sang their cadences to the harmonious accompaniment of the skylarks. Those of us who " hiked " the coast in those far-off days have happy memories of unspoiled beauty. 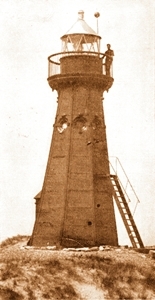 With the completion of Clifton-drive in the early 'seventies, Lytham Lighthouse, on the summit of a high sand hill between Lightburne-avenue and Riley-avenue, became a popular resort for Blackpool picnics. A Town in the Wilderness. The idea of founding a town in the wilderness belongs, primarily, to Mr. James Fair, father of the late Mr. Thomas Fair, and grandfather of Mr. James Stretton Fair. Mr. James Fair, agent to Mr. Clifton, resided at Warton Hall, and he developed the east end of Lytham—then a marsh—by constructing Liggard Brook and draining the land water into Lytham Dock. Mr. James Fair, by the way, was responsible for the extension of the railway from Kirkham to Lytham in 1846. The late Mr. Thomas Fair actually began the evolution of Lytham Common into the town of St. Anne's-on-the-Sea, Ansdell and Fairhaven. When Mr. Fair informed Lady Eleanor Cecily Clifton that he was going to build houses in the sandhills at St. Anne's, she told him they would not stand ! A few years before, when a farmer was told by Mr. Fair that Lady Cecily was going to build St. Anne's Church, the farmer remarked, " Well, Mr. Fair, we shall all be scrat up ' by the rabbits ! " Mr. Fair had plans prepared for an hotel, a perspective sketch of which he pointed out to me on one occasion over the mantel in his office. Before the work proceeded, however, Mr. Elijah Hargreaves, who had been visiting Blackpool, walked through the sandhills on a sunny spring morning in 1874 and, having spied out the land, visited the estate office. I have heard the story of that visit from Mr. Hargreaves and Mr. Fair. The interview resulted in the formation of the St. Anne's Land and Building Company ; and the projected hotel (but without an imposing lookout) was built mainly to the original design. The foundation stone of the town, laid by the late John Talbot Clifton when a boy, is on the St. Anne's Hotel premises. A mile square—from the pier to the Parish Church, and from Fairhaven-road to St. Leonard'sroad—was leased to the Land Company, who became the creators of a new health resort. A promenade was formed, public gardens laid out and a pier constructed. In June next the pier will celebrate its Golden Jubilee. It was opened on 15th June, 1885, by the Honourable Fred Stanley, father of the present Earl of Derby. The early settlers—the Duckworths, Ogdens, Taylors, Roberts, Rawstrons, Heaps, Shepherds, Walmsleys, Smiths, Hamiltons, Lords, Porritts, Allen, Worthington, Englands, Cooksons, Rhodes, Pennington, etc.—were endowed with the faith that literally removed mountains of sand, and the things they hoped for and strived for are seen to-day in a community of 15,000 souls with property of the value of approximately three million sterling. The wilderness blossomed as the rose ; the waste of sandhills became a veritable gold mine in site values. The men of Rossendale, like Caesar, came, saw and conquered, and if those who now sleep with their forefathers could be taken on a motor trip round our labyrinth of streets and gardens, and see with the eye of actual vision what they saw with the eye of faith, they would be gratified that their successors had been worthy of the founders' traditions. Fortunes have been made by speculators in St. Anne's land and property, and fortunes have been lost. Many investors failed to hold on till brighter days dawned, and men with ready cash secured the bargains. The " Newcomer " often discerned the possibilities of development.
" The community never advances except on the achievements of the individual." 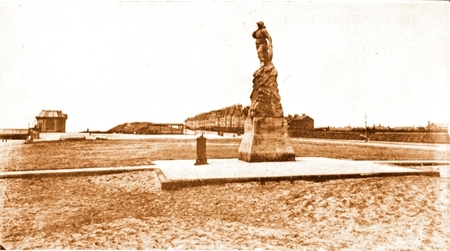 In 1878 a local government district was formed between St. Paul's-avenue (the boundary of Lytham) and Squires-gate, and the first Local Board of Health was elected, with James Astley (chairman), John Ogden, Robert Hargreaves, William Pomfret, John Allen, John Singleton, William Henry Howarth, Thomas Swarbrick, William Cross, James Parkinson, Hansom Hamilton and John Marks. Mr. W. J. Porritt and Mr. Thomas Fair joined the board two years later. In 1878 the rateable value of the district was £8,409, and by 1880 it had increased by £100 only. In 1890 the rateable value was £12,087, and the total rate 1s. 6d. By 1900 the rateable value had increased to £42,296 ; by 1910 to £90,000 ; 1920, £104,962 ; and at the date of incorporation (1922) to £128,703. In 1881 the population was 1,200 ; in 1891, 2,588 ; in 1901, 6,807 ; 1911, 9,837 ; 1921, 11,463 ; 1931, 15,147 ; the total for the whole Borough of Lytham St. Anne's being 25,764. The schools of St. Anne's materially assisted the development of the town. Private schools began to multiply in the earliest days. Kilgrimol and Montauban were opened in 1875. These were followed by Miss Davidson's School for Girls, succeeded by the Collegiate School in 1885; the High School in 1878 (now St. Anne's School, Windermere) ; Sandy Knoll ; Oxford House in 1888 ; St. Anne's College ; the Grammar School in 1890 ; Lawrence House in 1895 ; Saxonholme in 1897 ; Sea View Ladies' School ; Links School ; Lindenhurst ; and others. King Edward VII. 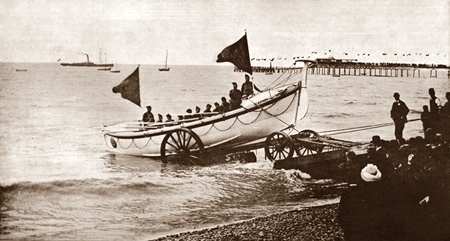 School was opened in 1908, and Queen Mary School in 1930, both built and maintained by the rich endowment of the Lytham Charities. The spiritual needs of the town, by the erection of churches, pioneered the population. The Parish Church of St. Anne existed as a chapel-of-ease to the mother church of St. Cuthbert, Lytham, till 1877, when, by an Order in Council, St. Anne's was created a separate ecclesiastical parish. South-drive Wesleyan School-Chapel was opened in 1877, the first Baptist Church in 1886, Church-road Methodist Mission in 1888, the Roman Catholic Church in 1890, South-drive Methodist Church in 1892, the Congregational Church in 1896, St. Thomas' Church in 1900, Church-road Methodist in 1905, the new Baptist Church in 1910, King's-road Methodist in 1911, and St. Margaret's in 1925. A great factor in the development of St. Anne's has been golf. The late Mr. A. H. Doleman, M.A., principal of the High School, South Shore, introduced the game into the Fylde, and the late Mr. Talbot Fair introduced the pastime into Lytham St. Anne's. Eleven persons attended a meeting at St. Anne's Hotel on February 27th, 1886, the circular convening the meeting bearing the names of Mr. Talbot Fair and Mr. James A. S. Fair. Mr. A. Wykeham Clifton was elected president, and Mr. Talbot Fair hon. secretary. The course lay to the north of St. Anne's railway station, a portion of which is now the Old Links. This course remained in use for 12 years, when the Royal Lytham and St. Anne's was opened. The Marquis of Lorne opened the clubhouse on March 5th, 1898. The world's greatest golfers—amateur and professional—have played over the course in open championships. The present secretary, Mr. T. Pym Williamson, " The Chevalier of Secretaries," has filled the office with distinction for over 30 years. The other clubs within the borough are : Blackpool, Old Links, Fairhaven and Green-drive, with a total membership of 2,430. The late Lord Ashton, of Lancaster, a Freeman of the borough, took a kindly interest in St. Anne's, and, through his friend, the late Alderman C. F. Critchley, first and thrice Mayor of Lytham St. Anne's, his lordship made princely gifts to the town, totalling £110,000. These generous gifts were made for the purchase of the War Memorial Hospital (opened by Lord Derby on Charter Day, 1922), the purchase of the Ashton Gardens, a contribution towards the acquisition of the electric tramways, the War Memorial Monument in the Ashton Gardens, and the purchase of Fairhaven foreshore and lake. In 1922 Lytham and St. Anne's amalgamated and became an Incorporated Borough under the name of Lytham Saint Anne's. Many enterprising schemes were embarked upon, the latest of which —a boating pool and miniature golf links on the south foreshore—are at present in course of completion for season 1935. Thus, within the life of an individual, miles of blown sand, the habitat of the rabbit, the partridge and the skylark, have been transformed into a thriving garden-city health resort. The vision of the pioneers has been realised. Man has triumphed. Work, plus faith, has been the passport to prosperity. Greater developments are in the lap of the future. In the words of the King, " The root of good government is a live and active civic spirit."